Alex Jones of InfoWars talks to reporters outside a Senate Intelligence Committee hearing on Wednesday. Twitter has permanently suspended the conspiracy theorist, citing violations of its policy on abusive behavior. On Wednesday, Florida Sen. Marco Rubio tussled with Jones after Jones confronted and touched him outside a Senate Intelligence Committee hearing. And at a House Energy and Commerce Committee hearing, Twitter CEO Jack Dorsey faced questions amid criticism from Republicans that big tech companies suppress conservatives online. Dorsey denied that Twitter is politically selective. He tweeted: "I want to start by making something clear: we don't consider political viewpoints, perspectives, or party affiliation in any of our policies or enforcement decisions. Period. Impartiality is our guiding principle." But on Thursday, Twitter announced in a tweet: "Today, we permanently suspended @realalexjones and @infowars from Twitter and Periscope. We took this action based on new reports of Tweets and videos posted yesterday that violate our abusive behavior policy, in addition to the accounts' past violations." Twitter linked to its page detailing its policy on abusive behavior. That policy states, in part: "You may not engage in the targeted harassment of someone, or incite other people to do so. We consider abusive behavior an attempt to harass, intimidate, or silence someone else's voice." "This is the deep state striking back and really pressuring these tech firms to censor," Jones added. In August, Dorsey explained why Twitter had not banned Jones then. "He hasn't violated our rules. We'll enforce if he does," Dorsey tweeted. In an apparent reference to other tech companies that had banned Jones, he said that Twitter would not "succumb and simply react to outside pressure." Dorsey added, "We're going to hold Jones to the same standard we hold to every account, not taking one-off actions to make us feel good in the short term, and adding fuel to new conspiracy theories." As NPR's David Folkenflik noted, "The ideas that Jones shares are particularly noxious, the idea that Sandy Hook massacre of schoolchildren was a hoax, the idea that 9/11 was an inside job, and other things." Jones is facing defamation lawsuits, most centering on comments about school shootings. 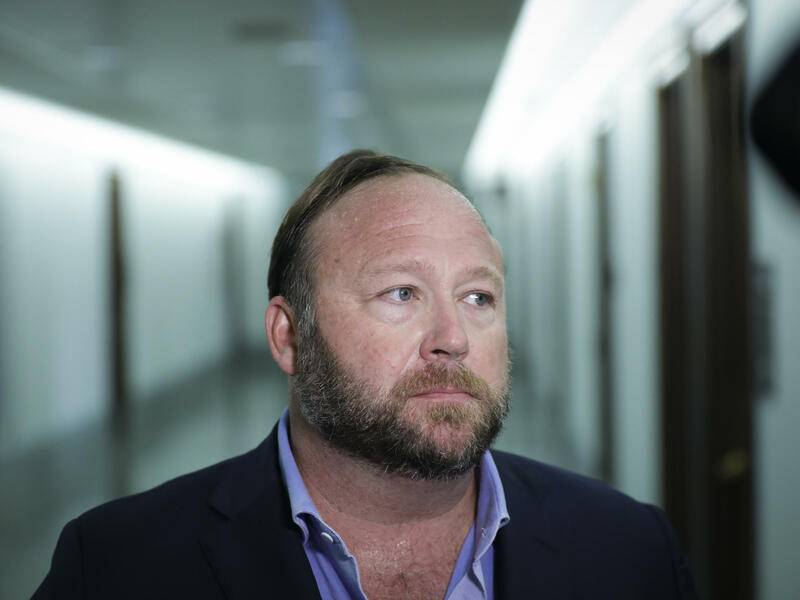 After the earlier bans, Jones said that "America has been sold out," and the Infowars Twitter feed declared that the moves against his company were "communist style censorship."